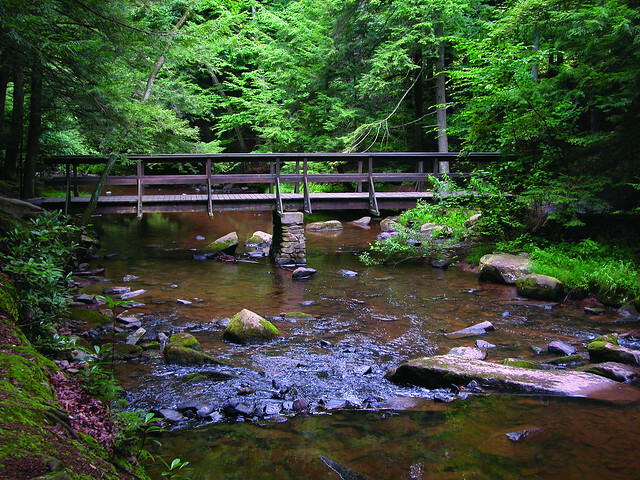 Reeds Gap State Park is 220 acres of wilderness in the New Lancaster Valley of Mifflin County. Large hemlocks and white pines cast cool shadows over Honey Creek, which flows through the park. Take the Milroy Exit. Turn east toward Milroy. At the traffic light, turn left onto Old US Hwy 322. Continue straight onto Hill Street then make a right onto Sigler Street. At the stop sign, continue onto South Main Street. In 0.3 mile, keep right to stay on South Main Street. At the next stop sign, continue straight onto Honey Creek Road. Honey Creek Road turns left and becomes Locke Mills Road. From Locke Mills Road, turn right onto New Lancaster Valley Road and follow it for 3 miles to Reeds Gap State Park. A park educator offers programs during the late spring and summer months. Organized groups and schools can request special programs by contacting the park office. The annual Reeds Gap Fall Festival is held the second Saturday in October and features many children’s activities. This activity or structure is ADA accessible. Some picnic tables, the restroom in Parking Lot B, and the park office are ADA accessible. Service roads may be used to provide access for people with disabilities.